To mark the Centenary of the Battle of the Somme the Bottesford 1st World War Centenary Project is organising a community showing of the restored feature length documentary – ‘The Battle of the Somme‘. The Imperial War Museum has restored the film and made it available for viewing in centenary commemorations of the Somme campaign which cost the lives of so many in 1916. 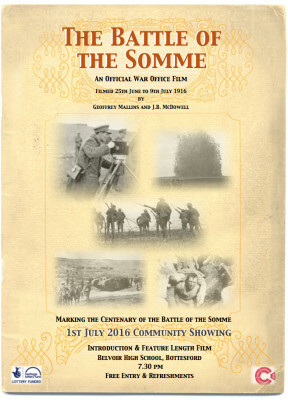 Filmed between 25 June and 9 July 1916 it was the first film to record battle zone action. It was immensely popular and aroused great interest. By October 1916 the film had received around 20 million admissions (the UK population at the time was 43 million). Everyone is welcome on Friday 1st July at 7.30 pm at Belvoir High School. Free admission and refreshments. We are most grateful for the support of the Heritage Lottery Fund, the 1st World War Centenary Partnership Programme led by the Imperial War Museum and to Belvoir High School for use of the School Hall and film projection facilities. This page was added on 21/03/2016.